State Bird Provisions in San Francisco has been on my radar for a while. I’ve been meaning to try it even before Bon Appetit named it 2012’s Restaurant of the Year. My first attempt at eating at State Bird last April was a utter fail. Mike and I were road-tripping down the Pacific Coast with a wild dream of hopping in for some late-night nibbles, but we arrived a bit too late – by the time we rolled into town they were closed. We didn’t try again for another year, but the second try was the charm. Armed with hope and no reservations, we managed to grab a seat at the bar. The bar is by far, the best place to be at State Bird. You see everything coming out from the kitchen, which is ideal. The kitchen knocks out not-so-tiny plates of deliciousness that come out randomly, much like dim sum. Servers come around with trays and carts and hawk their wares, letting you pick and choose your pleasure as you deem fit. We tried the guinea hen dumpling, garlic bread with burrata, duck liver mousse, and a barrage or other bites of pure yumminess. Everything we had was delicious, but the simple, rustic, homestyle curried carrot soup served in tiny cups was one of our favourites. It was so addictive that Mike ended up having two servings. Creamy, lush and full of curry goodness I knew I had to recreate it at home. This recipe is so simple that I hesitate to even call it a recipe. It’s more “simmer everything together and take your hand blender to it.” I like my soups on the thicker side, but feel free to thin it down with extra stock if thin soups are your thing. The sweetness of the vegetables and the spice of the curry make this a perfect pick-me-up winter soup. 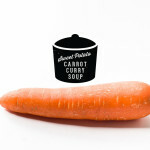 i am orange, i am curried: i am sweet potato and carrot curry soup! Peel your carrots and sweet potato and roughly chop. Place into a pot with the vegetable broth. 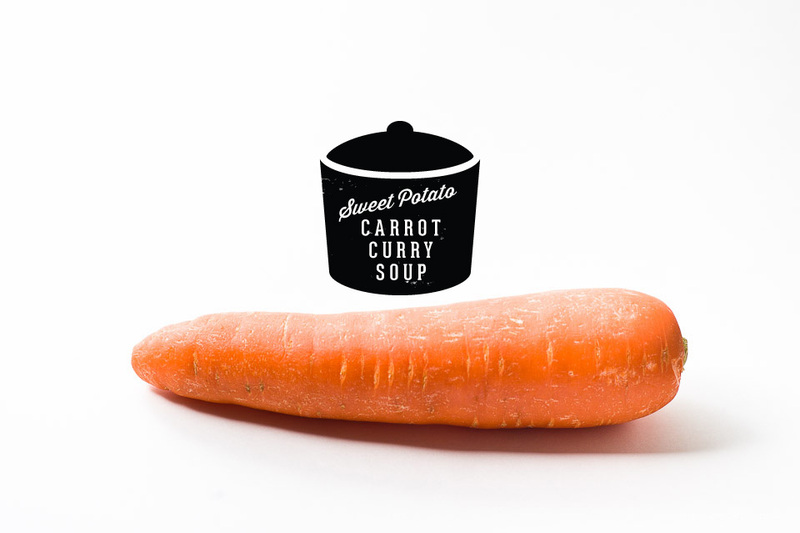 The broth should cover the carrots and potato. Bring to a boil and then lower the heat to a simmer. Simmer for 20 minutes or until the carrots and sweet potato chunks are fork tender. 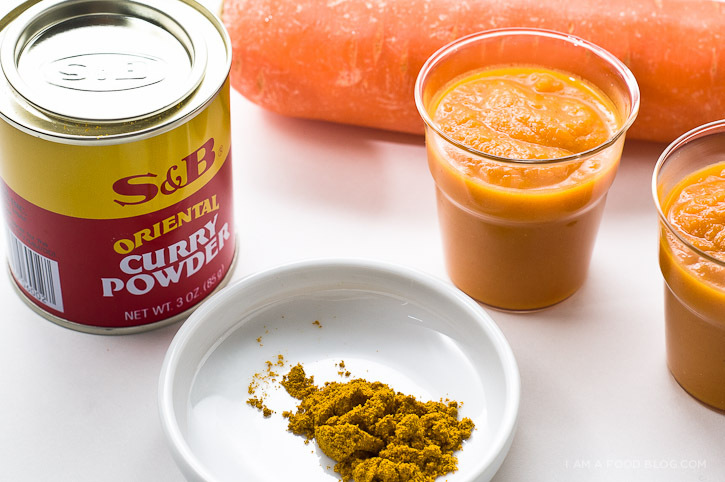 Blend with a hand blender, season with the curry powder and salt and pepper to taste. Welcome back. I never unsubscribed to your rss feed in hopes that you would one day return. I love your blog. Yay! This is exactly what I want to eat on an overcast day, looking out the window at the rain and feeling very cozy and happy inside. Maybe with a grilled cheese sandwich? You’re blog is beautiful! I love the simplicity and I love the photographs! There need to be more like you!! 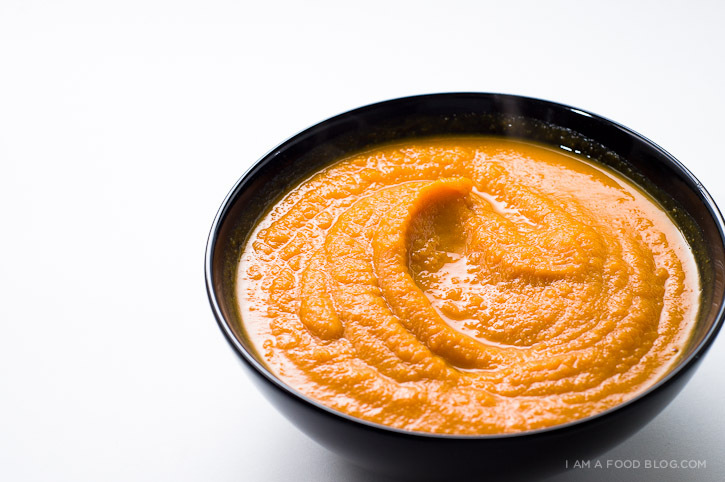 Lovely combination of flavors, made thicker, I guess this would make a knockout carrot puree. Thanks for the wonderful blog and graphics. The food looks great and you clearly have an affinity for quality and taste. HOWEVER…. yes, there is a “however”…. any time I see a recipe calling for straight up curry powder I encourage taking a little time to explore using a home-made mixture. Packaged curry powder by definition is lowbrow and this food is so NOT lowbrow. Just try a web search for this topic and see how much better things taste. Could be more Moroccan style, or south Asian, or Thai, or one of several African versions. All with different flavor profiles. Cheers and keep up the awesomeness! Hi!! !your blog is simply yummy! !d photographs made me hungry instantly….gonna try making this soup for my lil daughter, I constantly hunt for new recipes for her…thanks!!!! The added curry got me really interested in trying this one! yum! those additions sound delicious!